Got a sneaking suspicion the SEO company you hired might not be legit? Columnist Greg Gifford shares his list of red flags to look out for. Maybe I should have used an image of me jumping on a soapbox, because I’m about to preach. Spring conference season is in full swing, and I’ve had my mind blown several times already — not from amazing presentations (although there were several), but from conversations with business owners and newbies in the marketing world. Case in point: At an automotive conference, I talked to a dealer who had deleted his dealership’s Facebook and Twitter accounts on the advice of his SEO provider. He said they told him it wasn’t good for him to have an open forum where customers could say whatever they wanted about his business. I pointed out that the customers would still be out there, even if his dealership wasn’t… and he agreed! He said he thought that sounded weird, but he shrugged and figured his SEO guy knew what he was doing. I’ve talked to far too many business owners this spring who feel like they’re getting fleeced by their SEO providers. I’ve talked to far too many marketers who have just started off in the field who don’t know how to judge the value of the work their employer provides. Those conversations are scary, and they’re happening far too often. I thought I’d take a look at some red flags and warning signs with this week’s article here. While I’m stepping up on my soap box to preach, I’m also taking a step back and looking at the SEO industry without any preconceived notions. 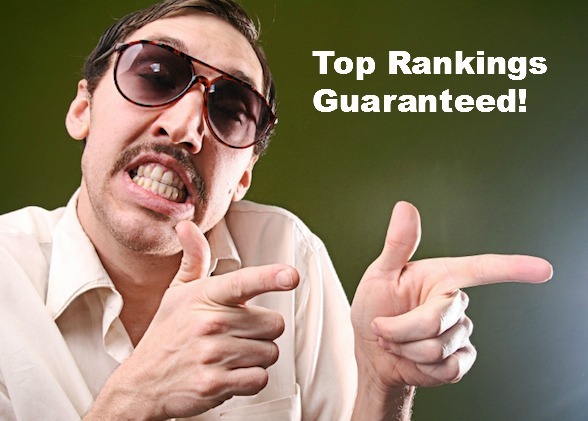 Following are 10 red flags which signal that you may be dealing with a shady SEO provider…. I talked to a dealership that suspected their content was just phoned in by their provider. Their blog was packed with “Honda Civic AC Repair in (city), (state)” posts — and there was a version for every car in their lineup. In total, we’re talking 15 or 16 posts, all exactly the same. The only thing different was the model of the car. And it gets better! They had taken those 15 posts and used them all again, for around 20 different cities — 300 blog posts, all exactly the same, just with a few keywords substituted in each one. Obviously, this was bad news. If you suspect you’re getting cruddy recycled content, copy a sentence from a post and search for it in Google inside of double quotes so you only see exact matches. If you’re like this dealer and see more than 42,000 exact matches, you know you’re in bad shape. I had a fun conversation at SMX West with a few attorneys. One of them was telling me that their new SEO provider sent their website guy a list of requests (They had never asked for access to WordPress, which is a bad sign all on its own). The requested title tag was nearly 30 words long, and they had at least 35 cities listed in the META KEYWORDS. They had also requested that all but the first sentence of the home page be hidden behind a “read more” link. If you’re reading Search Engine Land, then you’ve got access to a wealth of information about SEO best practices. If something seems shady or outdated, some simple checks online with trusted sources can help you confirm or deny your suspicions. If your provider’s entire SEO strategy is simply providing blog posts, that’s obviously bad news bears for your business. Clearly, there’s so much more to making your website a relevant resource than sharing a bunch of blog posts. Blogs are an important element, but they’re just one piece of a much larger pie. Sure, your bounce rate can be a good engagement signal, but it shouldn’t be your “be all, end all” metric. Far too many business owners obsess over their bounce rate when there are much more legitimate metrics for SEO success. At the last SMX West before he went on hiatus, Matt Cutts said something in an open Q&A that’s stuck with me ever since. When someone asked about their bounce rate, he told them that if their call to action was a phone call, they wanted a high bounce rate. If they were driving users to make a call, then a high bounce rate could mean that users were converting and then leaving. If your SEO provider promises a drastically lower bounce rate, you should ask them what they’re doing. Many times, they’re simply adding a script that pings Google Analytics every four or five seconds that a user is on a page. BOOM! The bounce rate is magically lowered — but not because the content is engaging or because customer behavior has changed. If you’re hiring an SEO provider, you’re doing so because you believe that their expertise will help your business get more visibility online. If they show you a menu of possible services, with everything broken out into individual elements, that’s not a good sign. You’re hiring them because they’re the expert — they shouldn’t expect that you know exactly what your business needs to gain more visibility in searches. It’s perfectly okay if they have several different packages, but if you’re expected to choose individual components to create your own package, that’s not a good business decision. So if your provider is doing it, run away. SEO can’t be automated — it takes people sitting there, doing the work. That’s not cheap. SEO takes manual work, and it takes time. If you’re paying less than $750 to $1,000 a month for SEO, that’s another bad sign. If your provider is charging a “setup fee,” ask them why, and what’s included. Setup fees are rare — but sometimes, since there’s more research on the front end of an SEO project, providers try to saddle new clients with a setup fee. It’s likely that they’re just asking for extra money because they can. If they’re charging a setup fee and your first month’s service fee, they’re not doing any extra work that first month, compared to what they do the following months. If your provider sets up Google Analytics for your site but refuses to give you access, you need to run away as fast as you can. There’s zero reason why your provider should deny you access to the analytics for your own website. Yes, this sounds crazy to most of us, but it happens all the time. On the flip side of the coin, if you start working with a new provider that doesn’t ask for access to your Google Analytics, you should run just as fast. Without access to your analytics, they have no idea what’s going on with your website — so how can they be optimizing for better traffic? Your provider should absolutely be providing a monthly SEO report. I talked to several providers at a recent automotive conference who were using a large, well-known provider who only produced quarterly reports. Since that was the only provider they’ve ever used, they didn’t know any better. I’ve also had a lot of people tell me that their SEO reports only show keyword rankings. In today’s world of localization and personalization, keyword ranking reports are worthless as an SEO success metric. Your reports should always show organic traffic and lead trends over time. So, those are the most egregious offenses that I’ve run into over the past year or so…. but I’d love to hear from all of you. If you’ve got a great story, please share it on social so we can both laugh AND use the examples to help people avoid the shady providers!